In fact, the report indicates that 52 percent of marketers opted for Facebook when they were asked to select just one platform. Many still argue that Facebook has a rather slow user growth. While it is true that the monthly active users’ growth for Facebook is rather slow (a 13.4 percent year-over-year growth as of December 2014), there are other statistics you should not overlook. Facebook has a solid user growth with other associated businesses such as Instagram, Messenger, and WhatsApp. As a result, this social networking site continues to be one of the leading social channels when it comes to monthly active users. However, the Social Media Examiner report also finds that majority of marketers have no idea if their Facebook marketing is effective or not. Just 45 percent of them think that they have an effective strategy. So the question now arises: How do you measure if your Facebook marketing is effective? The answer lies in your user engagement. Are your reaching out to the right people? Are they interacting with your posts? 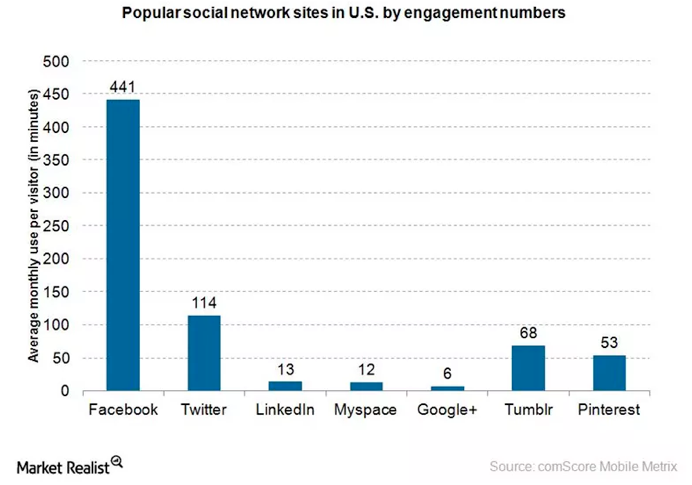 The following chart from comScore Mobile Metrix shows that Facebook has exceptionally high user engagement. The average mobile user engagement on Facebook is over seven hours, which happens via both browsers and apps. In comparison, the average engagement of mobile users on Twitter is just two hours in a month. It is nearly an hour for Pinterest and 68 minutes or Tumblr. Facebook therefore provides enough opportunity for marketers to gain portfolio exposure for their brand. 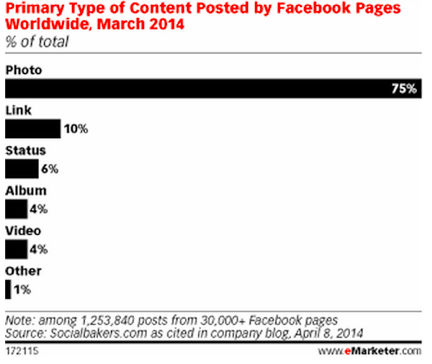 Besides, the conversion rates are also higher for Facebook. According to JeffBullas, the conversion rates of Facebook organic is 20 to 30 percent and the same for Facebook ads is 18 to 20 percent on their campaigns. In comparison, it was one to three percent for paid Twitter and eight to nine percent or organic Twitter. But then why many brands are still struggling with Facebook engagement? The truth is, most of them only speak about their products. While people who are following your brands on Facebook are interested in your products or services, they really don’t want to hear about them all the time. They don’t come to Facebook or any other social networking sites just to see advertisements. Instead of bombarding them with advertisements and promotional content, focus on your content. Make them both relevant and personal so that your users are motivated to interact with your content without being pushed. 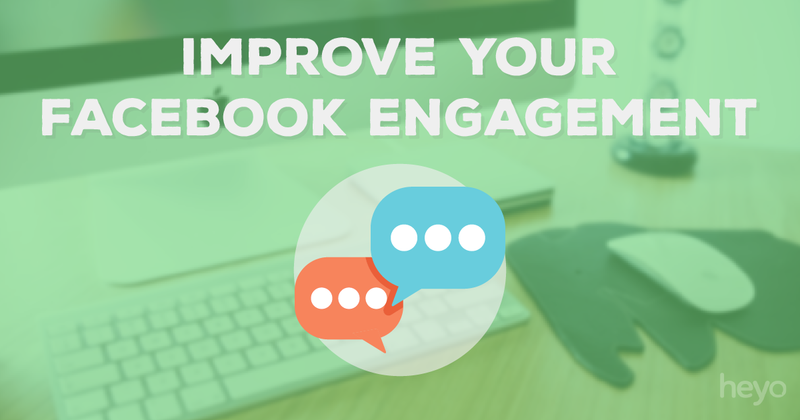 Here are 3 strategies you can implement today to improve your Facebook engagement and growth. A successful social media agency knows the benefits of balancing different types of content. People don’t like to read same type of content over and again. They look for variety; if all your posts on Facebook have similar look and feel, chances are users will start passing them over soon enough for something more interesting. To improve your user engagement, make your Facebook page more interesting. Use different types of content forms to your advantage. Share photos, infographics, links, videos, articles, questions and so on. See the type of content that your fans best engage with. You can leverage the data provided by Facebook’s Page Insights to identify the types of posts that achieve greater user engagement on this social networking site. This will help you take out the guesswork and focus more on the type of content that your fans prefer the most. Social photos generate more user engagement and Facebook is no exception. A 2014 eMarketer research indicates that photos accounted for 75 percent of Facebook page posts worldwide. The research also finds that photos are the most engaging form of content on this social networking site, achieving 87 percent of user interaction rate. It is therefore no surprise that companies offering social media marketing services largely depend on photos to generate user engagement. 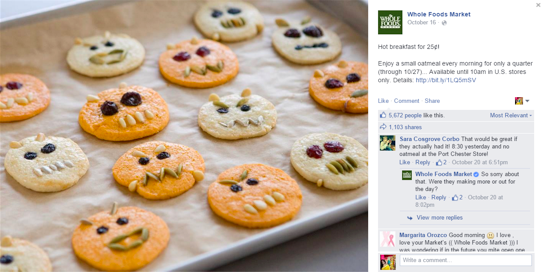 Whole Foods, for example, use photos to solve problems of their fans. They use simple images along with captions showing solutions to general problems faced by their fans to improve their daily lives. The company, as a matter of fact, has also received significant marked engagement using this strategy. Use larger images as they are more likely to receive more likes, comments and shares. Also, it is better to upload photos/videos and publish them directly into your post rather than posting a link with a thumbnail. Another way to leverage photos is to crowdsource your photo captions. National Geographic is using this strategy for their Facebook marketing. They ask their fans on this social platform to write captions for their photos and many of their posts have received more than 250,000 interactions. To leverage this strategy, use provocative and/or inspiring images that trigger the emotions of your fans. And to boost your user engagement, don’t forget to offer an incentive or a reward at the end of the campaign. According to KissMetrics the best time to post on Facebook is around noon and a little after 7 PM. And the best day to share your post of Facebook for maximum interaction is on Saturday. However, JeffBullas suggests that marketers should post content during the ‘non-busy’ hours when fans are not busy at work. They suggest the 8PM to 7AM is the best time for posting on this social platform to get maxim numbers of likes, shares and comments. They found that posts made between these times receive around 20 percent more user engagement. In addition, JeffBullas recommends marketers to publish their major content on Wednesdays and Sundays for better engagement. They argue that fan engagement is at least 8 percent higher than the average on Wednesdays. Also, limit your posts to one or two times a day for higher user engagement. These are just a few ways you can tweak your Facebook marketing strategy to improve user engagement and there are more. Some of these strategies will work for you while others may not. But these three basic guidelines will surely help you increase engagement if you can properly implement them to spark your Facebook fans’ interest. But remember that it’s all about your fans’ preferences; do what they want you to do.